By Colin in Publications on 20 June 2017 . Essigella californica, tended by an ant, on a needle of a southern California Ponderosa pine. Photo taken June 2013 by C. Favret. PhD student Thomas Théry recently published the first chapter of his thesis. Here’s a brief exposé of his work. 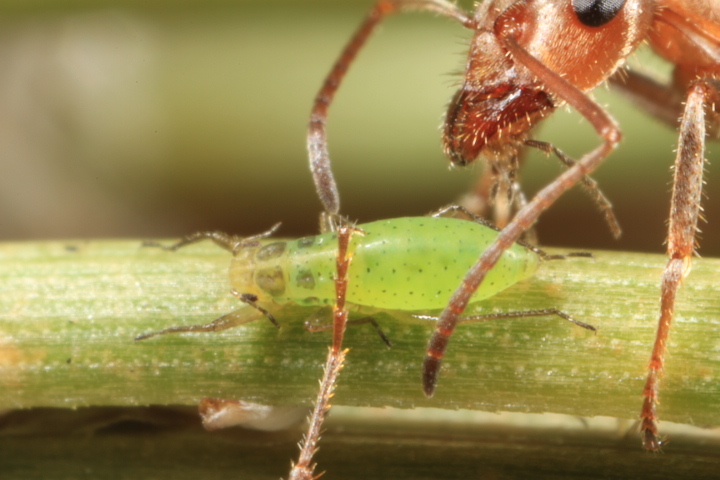 Aphids of the genus Essigella live in North America and feed on pine needles. One of these species, Essigella californica, has been introduced in Europe, North Africa, Asia, Oceania and South America. Essigella californica is a species that could cause great damage in pine culture where it has been introduced. Thus research on control methods are undergoing in order to restrain additionnal damage caused by the species. However, it is important to fully grasp the identity of the populations and the biology of the species so that suitable control methods could be brought. This species is morphologically close to many other species of Essigella and no genetic study has confirmed that the introduced populations belonged well to this species. The study of three genes (ATP6, COI, and GND) on twelve introduced populations of Essigella californica has confirmed that these ones belonged to this species. The study of a fourth gene (EF-1α) has revealed that these twelve populations could have been separated into four distinct groups showing that the introduced populations had at least four origins and that the introduction of this species outside North America took place at least four times.